SAN FRANCISCO (CN) – A three-judge panel of the Ninth Circuit on Tuesday appeared unmoved by the Trump administration’s request to reinstate the travel ban, but at least one judge expressed skepticism that discrimination against Muslims motivated the president’s controversial executive order. Circuit Judges Michelle Friedland, William Canby Jr. and Richard Clifton badgered August Flentje, Special Counsel for the U.S. Attorney General’s office, during the one-hour hearing that focused on whether the panel should overturn the temporary restraining order placed on President Donald Trump’s controversial travel ban by U.S. District Judge James Robart this past Friday. At one point, Flentje conceded the judges appeared unpersuaded by his argument. “I am not sure I am convincing the court so I’d like to make one last point,” he said after a round of aggressive questioning by all three judges. The Trump administration’s position during the hearing hewed closely to the legal arguments they have made since Washington state Attorney General Eric Ferguson sued to block the travel ban last week. First, the president has broad discretion when it comes to the nexus of national security and admittance of noncitizens into the United States. Second, Washington state does not have standing because there is no harm to it specifically, and even if there is a harm the restraining order in place is overbroad, government lawyers argue. Friedland pointedly asked Flentje at one point if “a president’s decision in this regard is essentially unreviewable” – essentially asking the attorney to acknowledge there have been instances where courts have reviewed a president’s decisions regarding national security. Flentje conceded courts had recourse to “limited review,” but argued the executive order as signed by Trump did not warrant such review. When asked what type of review was appropriate in the government’s opinion, Flentje pivoted to the matter of standing. However, he did not make much progress on that front. The judges seemed to accept Washington state’s argument that the travel ban’s detrimental effect on its university systems, in terms of the inability of their faculty and students to travel back and forth freely from the seven affected Muslim-majority nations, constituted a proprietary interest sufficient to grant standing. But the panel seemed less convinced that the state could sue on behalf of its citizens affected by the ban in this particular instance, though it noted cases where U.S. citizens have sued the government over immigration on behalf of noncitizens due to their own harm under the Constitution. The judges demanded why the government thought those instances were different. “The state doesn’t have the same constitutional rights a wife does,” Flentje said. But Clifton asked about another case where a school sued on behalf of its scholars, a line of questioning Flentje struggled to parry. Furthermore, all three judges entertained the state’s argument that Trump’s campaign statements about how he would seek to block entry into the United States by all Muslims – and recent comments by White House cybersecurity adviser Rudy Giuliani on Fox News that the president had asked him how to make a Muslim ban that was legal – constituted enough evidence to move forward with a case exploring whether there was discriminatory intent in the travel ban. The travel ban, signed by Trump on Jan. 27 after a week in office, banned entry of all refugees for 120 days, halted admissions from war-torn Syria indefinitely, and barred entry by citizens of Iraq, Iran, Sudan, Libya, Somalia and Yemen for three months. Washington state’s legal argument asserts the Trump administration violated the First Amendment by discriminating against Muslims through the travel ban, noting the ban involves only seven nations with mostly Muslim populations and also stipulates that precedence in visa distribution and refugee resettlement will be given to persecuted religious minorities. Discriminatory intent, difficult to prove because evidence of intent is typically scant, is easier to show in this case due to the public pronouncements of Trump and his staff on the campaign trail, Washington state Solicitor General Noah Purcell said during the hearing. “I think the public statements of the president and his top advisers provide strong intent evidence to go forward on this claim,” Purcell said. Clifton, the one judge on the panel who is reputed to be moderately conservative, fired off an aggressive line of questioning toward Purcell. The judge reminded Purcell that in order to get a restraining order he had to prove a likelihood of success on the merits, and that there was plenty of evidence to show Trump’s decision had more to do with terror threats than religious discrimination. “Would it be possible to identify those seven countries as a possible threat without the motivation of religious discrimination?” Clifton asked Purcell at one point. In an interesting aside, Canby reminded Clifton that Flentje and the federal government bears the burden of proving the restraining order should be lifted – at which point Clifton abandoned his line of questioning. Friedland also followed up the exchange between the two judges by prompting Purcell to talk about the declarations and his evidence of the Trump administration’s discriminatory intent. This exchange toward the end of the hearing, combined with the aggressive line of questioning of Flentje and the apparent acceptance of the state’s standing argument, indicated the panel may be leaning toward keeping the nationwide restraining order in place – and setting the stage for a likely appeal to the Supreme Court. Friedland is a Barack Obama appointee and Canby was appointed by Jimmy Carter, both Democrats. Clifton was appointed by President George W. Bush, a Republican. Ninth Circuit spokesman David Madden said a ruling is likely later this week. 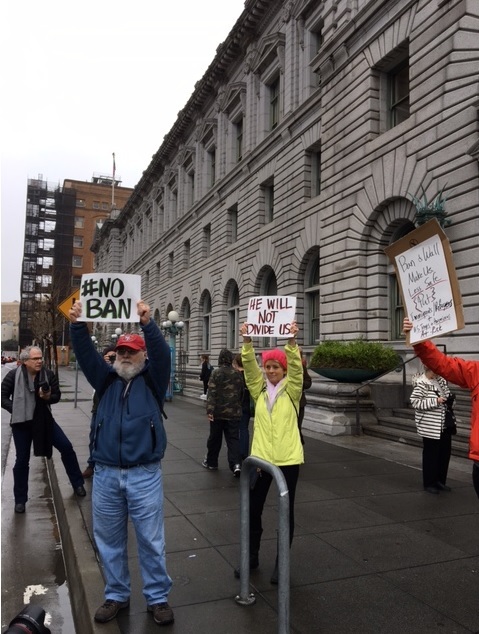 While the war of legal words raged inside the Ninth Circuit’s chambers, about 20 protesters gathered outside the court to demand that the travel ban not be reinstated. 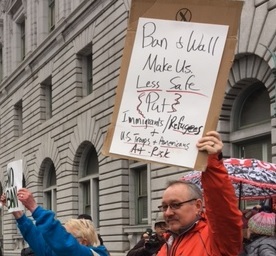 “This Muslim ban, whether the Trump administration wants to call it that or not, it’s hurting the very people who absolutely need to be safe,” said Leah Friedman, of Alameda, California. Friedman, who worked through her lunch hour to attend the late afternoon protest, disagrees with the administration’s recent insinuations that it has secret information that travelers and refugees from the seven nations affected by the ban pose a terrorist threat great enough to warrant the executive order. Christine Pierce traveled 90 minutes from Napa to protest in front of the courthouse because she wanted the panel to know the public doesn’t support the ban. 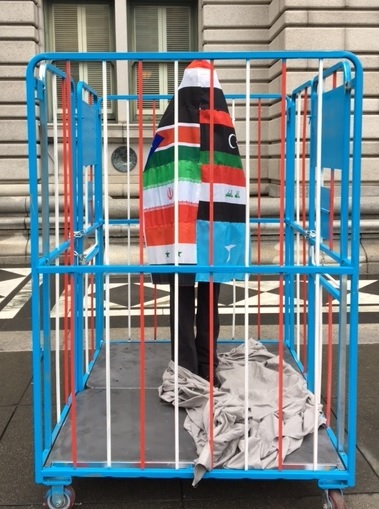 Ann Carey of San Francisco expressed confidence that the ban is illegal and will be overturned. Courthouse News reporter Helen Christophi contributed to this report.